Fall sport athletes get one semester to live as normal students. How do they use it? The student athlete lifestyle at Marquette is rigorous, constant and rewarding. With few days off and a brutal BIG EAST travel schedule, student athletes’ experiences are an extreme departure from typical student life. That’s before factoring in away games. 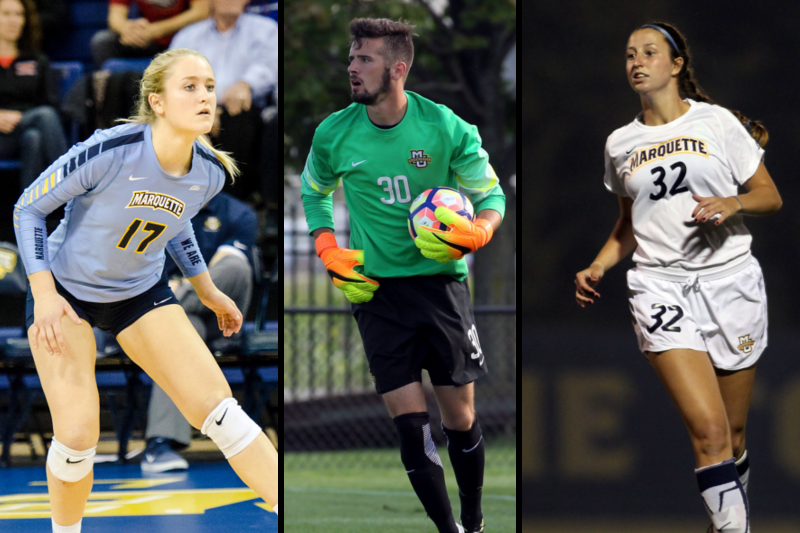 However, for athletes of Marquette’s three fall sports teams, men’s and women’s soccer and volleyball, senior student athletes spend one semester on campus away from the sport which dominated their lives. “I have so much free time. It’s amazing,” Roman said. For college seniors, one final semester isn’t just a chance to socialize and catch up on sleep. It’s an opportunity to do things they could never do when they were student athletes. Former men’s soccer player Mac Wheeler had a redshirt season, meaning his senior season was his fifth year. Wheeler graduated in time to free up one semester before he returns to Marquette for physical therapy school. The former Golden Eagle goalkeeper saw this time as a unique opportunity to do something he could never do while playing a Division I sport: volunteer in Costa Rica. Former men’s soccer goalie Mac Wheeler poses with co-workers in Costa Rica. 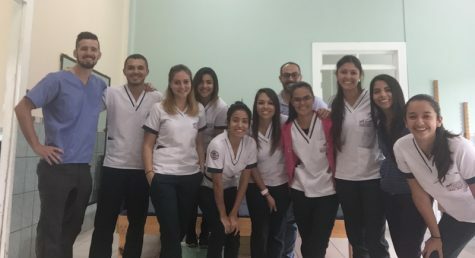 Wheeler will be doing free physical therapy for local residents living in a retirement home alongside students from a Costa Rican university until May. Wheeler had nine semesters at Marquette to dream of what he might do when he finally had four months without a commitment. For Wheeler, this semester signaled a shift in a new direction for his life and a period of transition. Roman enjoyed her student athlete experience as well, but this semester has given her an opportunity to earn her first internship experience. A journalism major, Roman is trying to break into sports media, so this semester she’s interning with Fox Sports Wisconsin. “It’s nice because I have class during the day so I can work 5 (p.m.) to 10 at night,” Roman said. It was tricky with her soccer schedule to gain on-air experience. When she tried to volunteer with MUTV, Marquette’s student television station, it was no small task. 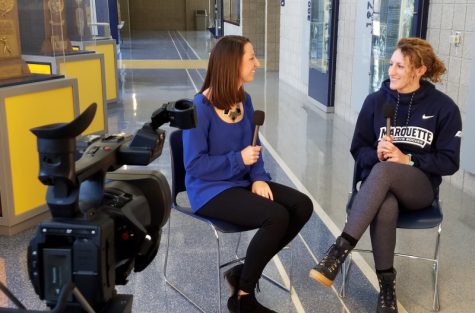 Lisa Roman interviews former Marquette soccer player Morgan Proffitt in the Al McGuire Center. But those were the steps she had to take to prepare herself for the professional world. “Otherwise it’s like, ‘Oh you’re trying to be an on-air talent, and when have you ever done this?’ Well, never,” Roman said. Gaining professional experience has been one perk of her final semester, but Roman has taken advantage of her free time in other ways too. Former volleyball player Lauren Houg is using her semester to gain professional experience as well. As an education major she’s required to do a semester of student teaching before she graduates, something she couldn’t do in the fall or the spring while she was playing. In order to finish the classes for her majors in education and communication studies, Houg had to take multiple 18-credit semesters, and on two occasions, summer classes. Despite all that, she was still taking some of her most important courses during her final semester of play. Like Wheeler, Houg is navigating a new path as her student athlete chapter ends. Her new passions aren’t all scholastic. Houg recently discovered an interest for cooking. Though she said it’s not necessarily easy to feel your identity changing. For all three, it’s an exciting new time as they exit their lives as student athletes and head toward the workforce, but even as they grow into their new identities, they remain the same people who came to Marquette as athletes.